Vattakottai Fort, meaning ‘Circular Fort’, is near to Kanyakumari in Tamilnadu state, India, on the Bay of Bengal sea shore. Built by the erstwhile Travancore kingdom in the 18th Century on the Bay of Bengal sea front, this fort is a protected fort. It has been renovated and attracts a lot of tourists. 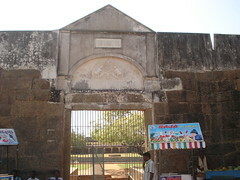 This fort is one among the historical places near to Kanyakumari. Climbing to the top of the fort and viewing the Bay of Bengal Sea for quite a long distance is the beauty of this spot. This fort was built watch enemies coming through sea at a distance. The hills which form part of Western ghats can also be seen from here. 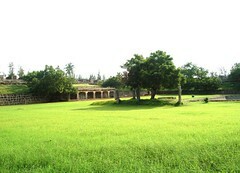 Vattakottai is one among the must-see tourist places in Kanyakumari. How Do I Go to Vattakottai Fort? Vattakottai Fort is at a distance of 7 kilometers from the southernmost tip of India, Kanyakumari, off Kanayakumari – Tiruchendur Road. Kanyakumari railway station is the nearest railway station to Vattakottai Fort. Thiruvananthapuram international airport is the nearest international airport at around 90 kilometers distance. I have visited the Fort at Vattakottai multiple times and my last visit was in 1997 December en route to Thiruchendur Murugan Temple (via Koodamkulam) from Kanyakumari. The site leveling work of the Koodamkulam nuclear power plant was going on that time.